If you asked any die-hard Apple user a few years back about the "ideal" MacBook Pro, he or she would have insisted on a 17-inch display, non-glare of course. Today, the 15-inch MacBooks are commonly accepted, and the Retina model is a worthy successor to the now discontinued 17-inch version. But fans don't quite agree on the entry-level notebook into the realm of Apple Pro notebooks. When the "Unibody" MacBook was absorbed into the MacBook Pro line and debuted as MacBook Pro 13, it became the new entry-level "Pro" model. Not everybody was happy: screen too small, display glossy, and not even a matte option? Fast forward a few years: the little MacBook Pro is now well-established and was refreshed recently, when Apple updated the current portfolio. Ivy Bridge says hello. The outside of the new MacBook Pro entry-level notebook looks almost identical to the predecessor (we are talking about the version "Early 2011", since we had no chance to test the "Late 2011"-model). The chassis is still a slim unibody structure made from solid aluminum. And why fix something that's not broken - the customers obviously appreciated the design. So what did change? 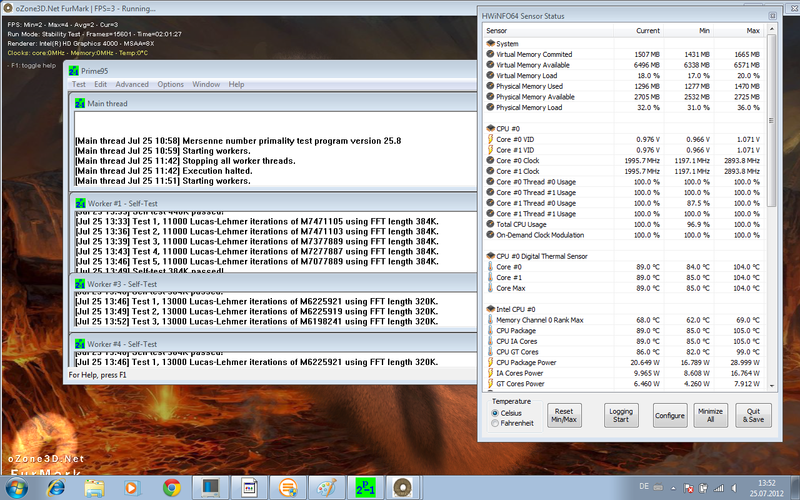 The most noticeable difference is the Ivy Bridge dual-core CPU Intel Core i5-3210M. This mobile CPU featured a 2.5 GHz core frequency and can overclock to a maximum of 3.1 GHz using Intel Turbo Boost. 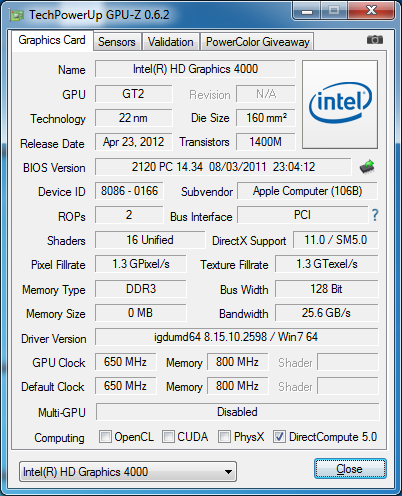 Courtesy of the new processor generation is the integrated Intel HD Graphics 4000. Additionally, the USB ports have been updated to USB 3.0. Other changes we will discuss more thoroughly in the respective sections. One thing up front: the somewhat low display resolution regrettably hasn't changed. "Beyond reproach". 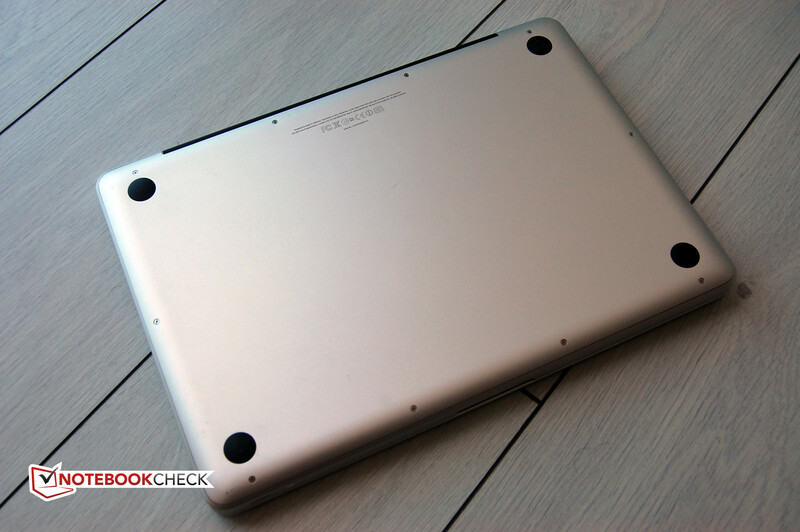 This was our verdict about the chassis of the Apple MacBook Pro 13 Early 2011. We are happy to report that we don't need to revise this statement for 2012. The aluminum unibody chassis offers superb build quality, high torsional rigidity, and doesn't "give" when pressure is applied. The compact dimensions, especially the low thickness of under 2.5 centimeter (under 1 inch), are not matched by that many competitors. The weight of about 2 kilogram (4.4 pounds), however, is nothing special in this class. We would prefer a larger maximum display angle, since it's restricted to about 45 degrees. The lid also swings back and forth a bit if it's released abruptly during the adjustment process. The black bezel around the display could be a little less prominent. The term "gentle evolution" hits the nail on the head. At first glance, nothing seems new as far as the port selection of the Apple MacBook Pro 13 Mid 2012 is concerned. Only an examination of the spec sheet reveals that the two USB 2.0 ports have been replaced with USB 3.0. The DVD-RW optical drive is now sourced from Hitachi-LG. Everything is virtually unchanged, including the location of the ports. 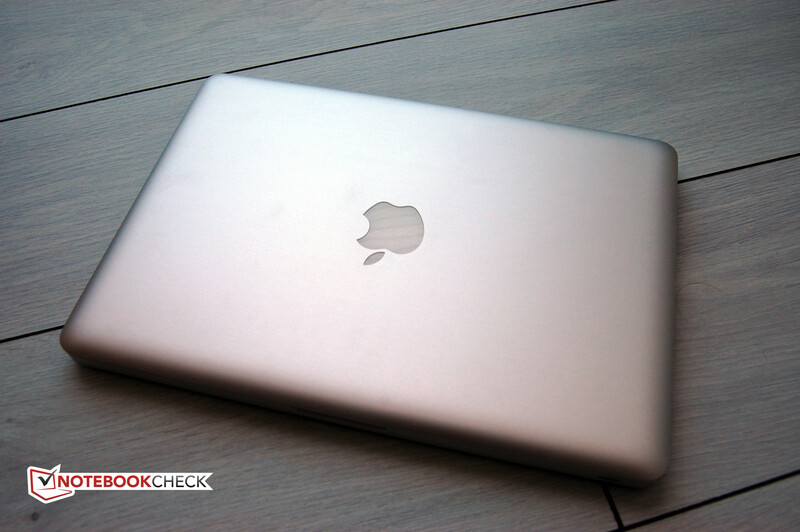 For details, please check our test of the MacBook Pro 13 Early 2011. We find it interesting that Apple did not eliminate the FireWire 800 interface. This means that the user has three ways of connecting high-speed peripherals: FireWire 800, Thunderbolt, and USB 3.0. That is second to none. Not much has changed from the predecessor. The LAN controller (Broadcom) supports Gigabit Ethernet, the WLAN controller (also from Broadcom) supports 802.11a/b/g/n (both 2.4 and 5 GHz). With Bluetooth 4.0, Apple incorporates the latest standard of the short-range wireless technology. The main advantage of the already three-year old technology is the decreased power consumption, which leads to better battery life. Apple usually ships their notebooks with only the most basic accessories, so it wasn't a big surprise that the box only included the power adapter and a few user manuals. Apple stores usually have a huge selection of accessories, both from the manufacturer itself as well as other vendors. "Unibody" usually means difficult maintenance. 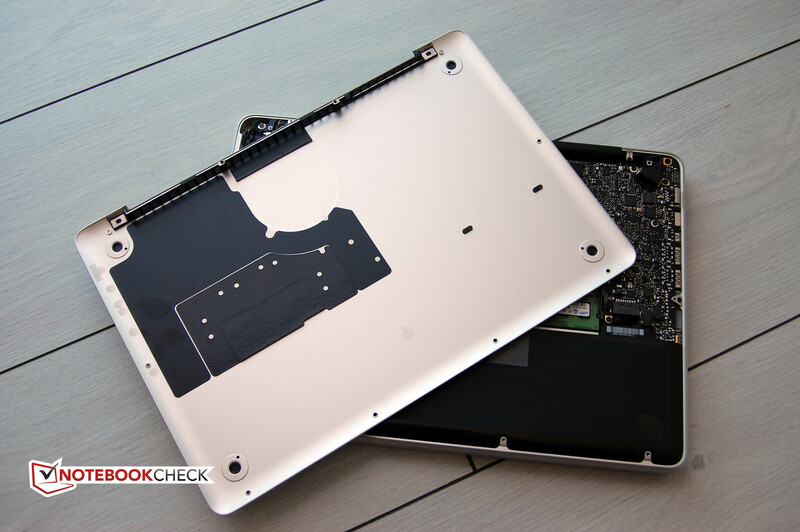 The MacBook Pro 13 Mid 2012 is quite user friendly in that aspect: after removal of ten small Phillips screws, a part of the bottom plate comes off and allows access to the internal components. 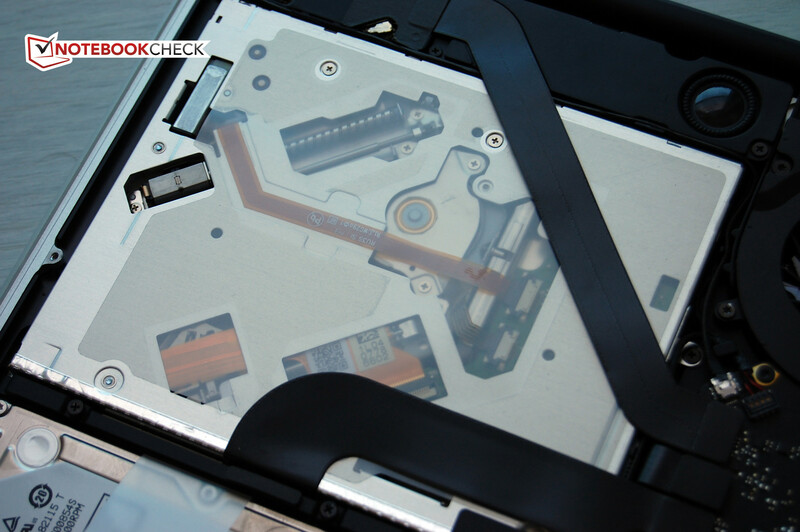 Hard disk drive and RAM are easily accessible and a breeze to change. The fan unit can be cleaned should it become necessary. Only the battery is not user replaceable. The notebook has to be sent in or needs to be taken to an authorized reseller in that case. Apple only offers a standard 12 month warranty. Users interested in extending the warranty to three years can take advantage of the Apple Care Protection Plan. The cost for the warranty extension is 249 Euro. 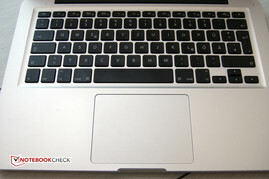 Since early 2011, neither the keyboard nor the touchpad have seen any changes. 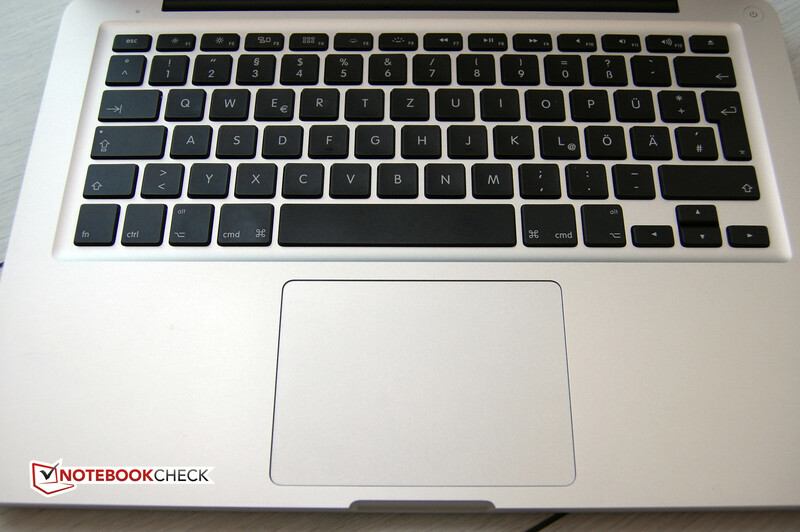 The keyboard is one of the best of any notebook in the 13-inch category. The keys don't have a lot of travel, but the feedback is excellent. Windows users might have to adapt to the different layout first, since some keys are missing or are labeled differently. In addition, the CTRL, ALT, and fn keys are in a different order. The Enter key could have been a bit larger. 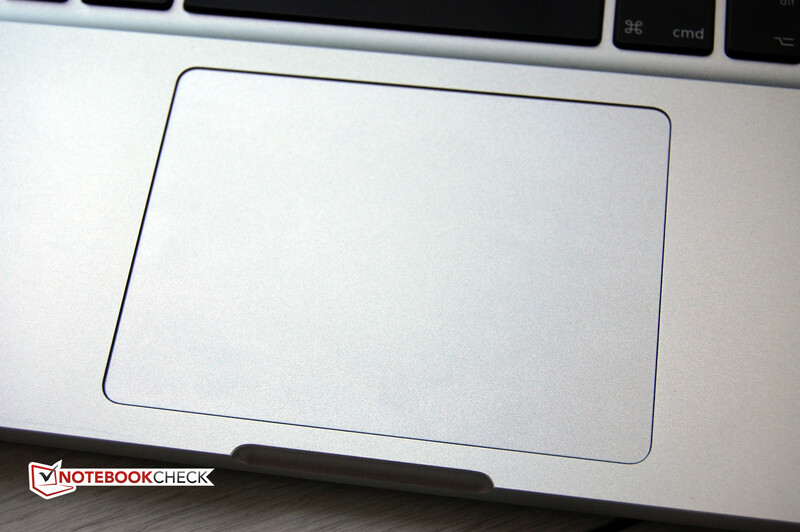 We appreciate the keyboard backlight, which also features an ambient light sensor and allows for automatic brightness control under Mac OS X. The touchpad is one thing for sure: sufficiently large - especially since we are talking about a rather compact 13-inch notebook here. The functionality is top notch, although some of the gestures only function under Mac OS X. The display remains unchanged. 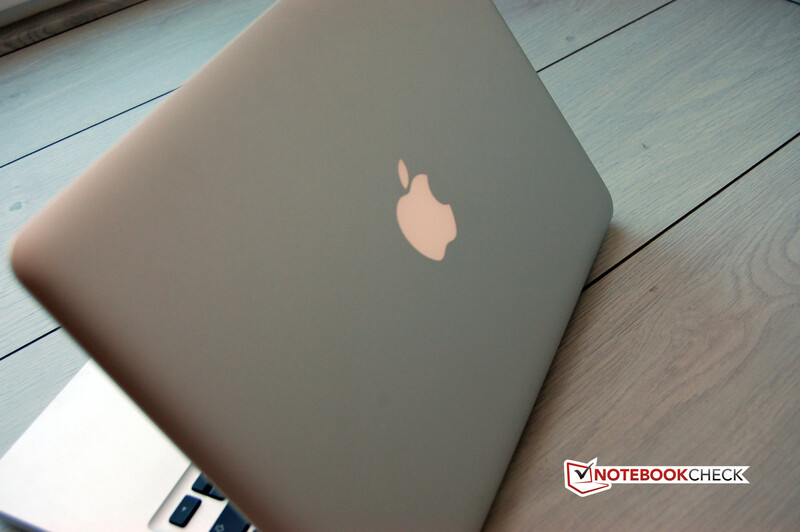 Starting with the MacBook Air 13 Mid 2012, Apple uses a 13.3-inch display with a reflective glass layer on top. The resolution is still at 1280 x 800 pixels. Since it's been quite a few years, we would have liked to see an update and a switch to a higher pixel count here. Fortunately, the aspect ratio remains at 16:10. Compared to 16:9, noticeable more vertical screen real estate is available. The panel is still using TN technology. Apple doesn't specify what they are using exactly, but we can assume that this entry-level pro device is using a comparatively inexpensive display. We are not being critical here: the display used does its job really well. Under Mac OS X, the maximum brightness is 299 cd/m2, while the brightness distribution is pretty even at 90 percent. Because of the low black value of 0.48 cd/m2, the contrast ratio of 623:1 is more than acceptable. The results under Windows are slightly better. We measured a ten percent increase in brightness. Since the black point is also a bit higher, the contrast hardly changes. Compared to the models from early 2011, there are only minor differences. We recommend looking at tests of the previous generation. Finally something new to report. With the introduction of the current processor generation, all models of the MacBook Pro series see a bit of a boost in performance. The CPU in this entry level model is the dual-core Intel Core i5-3210M. 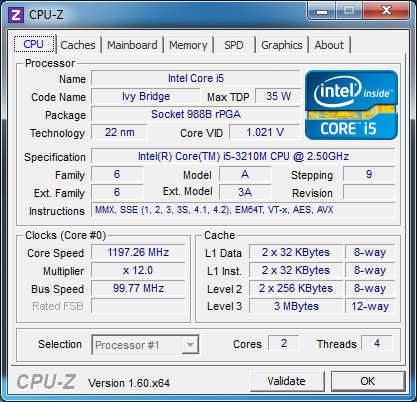 The mobile Ivy Bridge CPU has a nominal clock speed of 2.5 GHz. Under ideal thermal conditions, Turbo Mode can overclock all cores to 2.9 GHz. 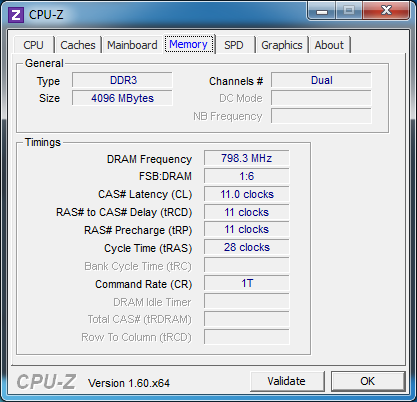 A single core can be overclocked to 3.1 GHz. 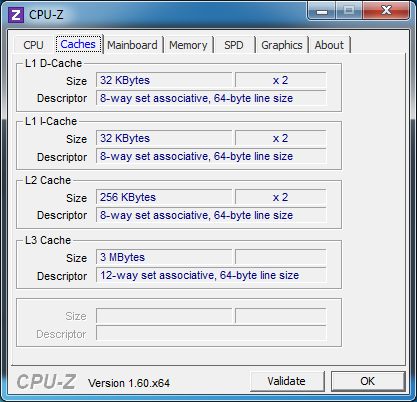 The CPU has Hyper-Threading and hence can support up to four threads in parallel. It is designed for a TDP (maximum thermal output) of 35 watts. 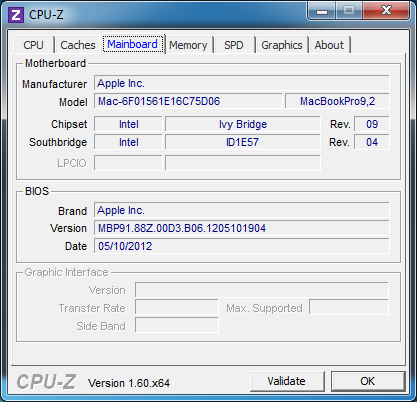 If the Apple MacBook Pro 13 Mid 2012 had been designed to compete with Ultrabooks, a ULV CPU might have been chosen instead. Since the Pro series is known as a workhorse, the processor choice makes sense. The notebook is equipped with 4 GB of DDR3 SDRAM PC3-12800. While this is adequate, we would have liked to see eight GB, especially considering that Mac OS X performs much better with ample RAM. As part of the processor update, the integrated graphics card sees a noticeable boost in performance. The little MacBook Pro now features the Intel HD Graphics 4000 and scores quite a bit better in our test. More on that later in our section on the graphics card. At the core of the re-design of the MacBook Pro 13 2012 is the CPU based on Intel's Ivy Bridge architecture. The Intel Core i5-3210M is one of the fastest dual-core CPUs and features clock speeds from 2.5 to 3.1 GHz. The processor, which has three MB of level 3 cache and a TDP of 35 watts, is usually installed in 14-inch and larger notebooks. Since Apple designed the Pro series for more demanding tasks than what the typical Ultrabook would encounter, this choice makes sense. 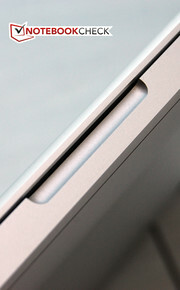 Those looking for an Ultrabook-like device in Apple's portfolio should consider the MacBook Air. In order to determine the performance and especially to check if the processor is capable of its full potential, we use the CPU benchmark tests Cinebench R10 and R11.5. In both tests, the Intel Core i5-3210M in the Apple MacBook Pro 13 Mid 2012 achieved exactly the performance we expected (based on previous measurements). We recorded 8936 points in the Cinebench R10 Multi-CPU-Rendering 32-bit test (64 bit: 10658 points). Utilizing only one core, the results are 4109 and 5298 points, respectively. Interesting is the pronounced scaling under 32-bit: using both cores, the result is roughly 2.2 times higher. The newer Cinebench R11.5 64-bit test confirms the results of the Cinebench R10. We measured 1.22 points in Single-Core-Mode and 2.87 points in Multi-Core-Mode. The results are identical whether the laptop is plugged in or running on battery power. The Intel Turbo Boost technology works without a hitch. During our tests, the cores always maintained the maximum frequency of 2.9 and 3.1 GHz, respectively. While CPU performance is determined by just a few factors - for example the thermal design of the notebook - overall system performance is a result of the interaction of all components: CPU, RAM, hard disk drive, bus systems, OS, and driver choices. To evaluate the overall performance, we use the PCMark 7 and PCMark Vantage benchmark tests. 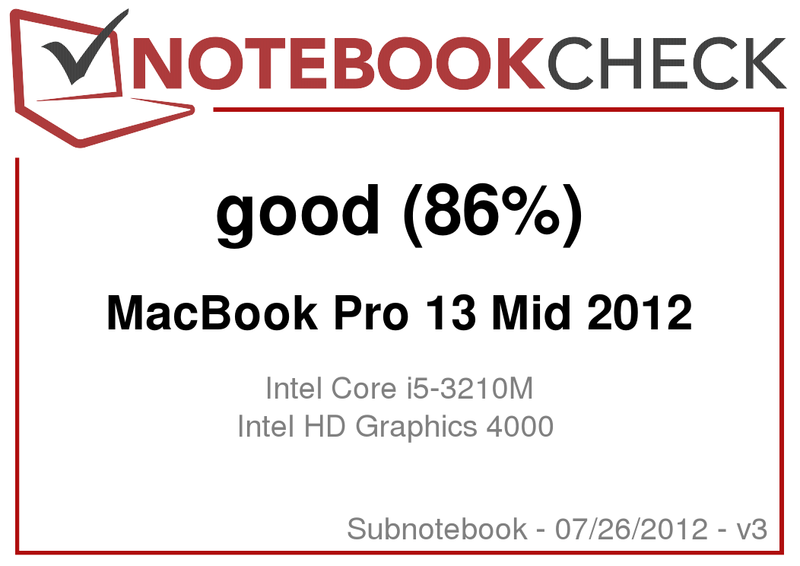 We'll just sum it up here: the performance of the Apple MacBook Pro 13 Mid 2012 didn't disappoint. Quite on the contrary: the little Pro can keep up with notebooks equipped with more powerful processors. Overall the Pro performs as expected. The system scored 6621 points in the PCMark Vantage test. This result has the MacBook Pro 13 slightly ahead of the Acer TravelMate P643-MG-53214G75Mikk (which features the same CPU) and only slightly behind the Fujitsu Lifebook E782, equipped with the most powerful Core i5 processor Intel Core i5-3360M. Working with the Apple MacBook Pro 13 Mid 2012 is both speedy and smooth. The only time we had to wait a bit was when editing high-resolution photographs. This is more due to the lack of RAM than lack of computing power. Our test system shipped with Mac OS X Lion 10.7.4, the then-current operating system from Apple. We doubt that that the transition to Mountain Lion will have any real impact on the results. To determine CPU performance under Mac OS X, we also the 64-bit version of Cinebench R11.5. Performance is very similar to what we saw under Windows. The minimal differences are probably due to measurement tolerance more so then actual differences between the operating systems. We recorded 1.21 points for rendering with one core, 2.89 points for two cores, and 16.66 during the shading test. Two of the preferred benchmark tools for Mac OS are Geekbench and Xbench. Since the latter test usually shows significant variations from one run to the next, we take the average of eight runs. Overall, the performance of the MacBook Pro is right were the technical specs indicate it should be. We did not discover any significant bottle necks limiting performance. The score for Geekbench was 6768 points. This is right where we expected it to be. The performance is in-between the iMac 27 Mid 2010 with Intel Core i5-760 and the MacBook Pro 13 Early 2011 with Intel Core i7-2620M. 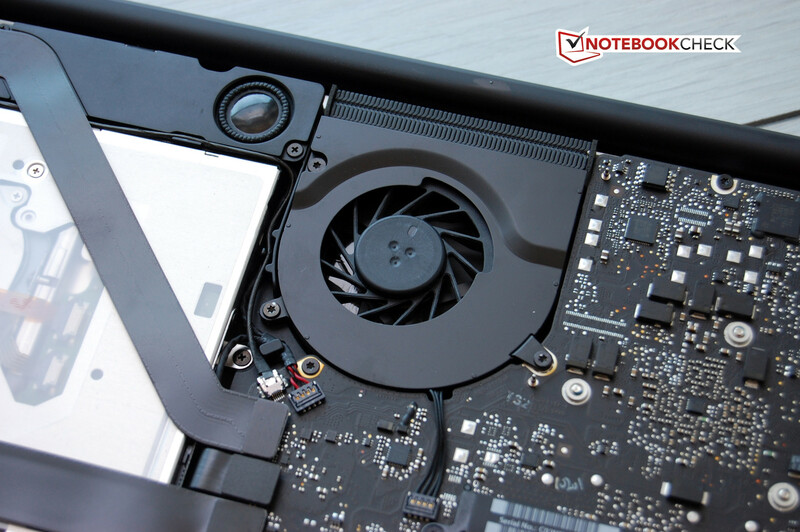 The hard drive in the MacBook Pro 13 Mid 2012 is a standard disk drive with spinning platters. The model is sourced from Hitachi, offers a capacity of 500 GB, and spins at 5400 RPM. Just like the specs, the transfer rates are not exactly spectacular. 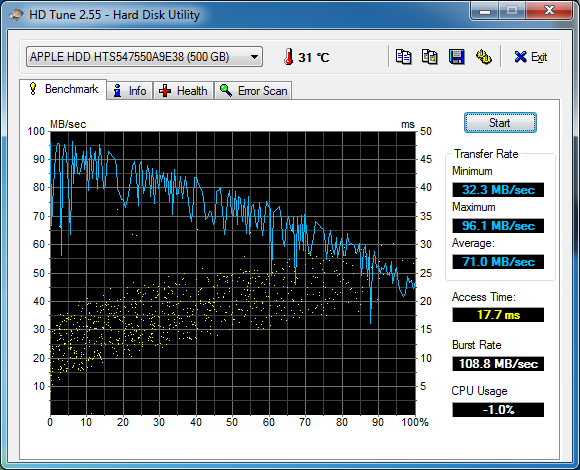 Both HDTune and CrystalDiskMark report a sequential transfer rate of about 70 MB/s, which is not very fast. The access time of 17.7 milliseconds is OK for a standard hard drive. Small, dispersed data blocks usually slow down the transfer rate significantly, and the Hitachi Travelstar is not any different in that regard. 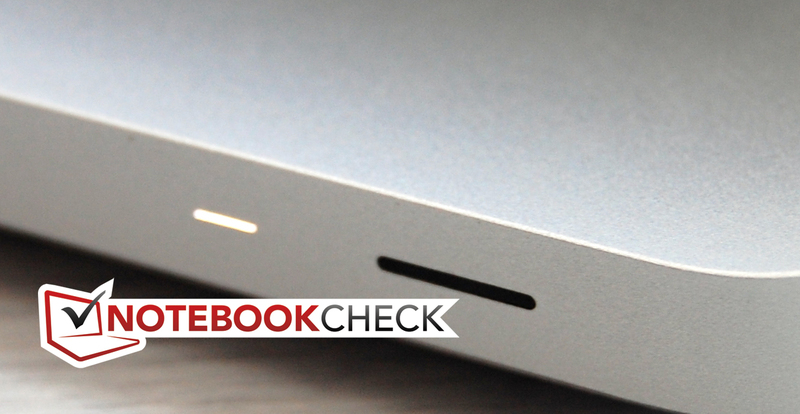 Apple outfits the lighter MacBook Air models exclusively with SSDs. The Pro models usually offer those modern and faster drives only as an option (save for the MacBook Pro Retina). To upgrade the conventional hard drive in our test unit to a 128 GB SSD, the price increases by about 200 Euros. For the 256 GB drive, Apple charges an additonal 500 Euro, and for the 512 GB SSD, 1000 Euro. We doubt that a potential buyer would chose the latter option, especially since replacing the hard drive with a SSD is not very difficult. With the move to Ivy Bridge processors, the integrated graphics card saw a significant jump in performance. Indeed the integrated graphics is good enough now to compete with some dedicated solutions in the lower middle-tier. There is not much more to say about the Intel HD Graphics 4000, especially considering that we have tested it in many different notebooks already. We ran a few tests with current games to see how the Apple MacBook Pro 13 Mid 2012 would perform. As expected, we were able to play many of the titles (two examples are F1 2011 and Anno 2070) fluently, as long as we set the details to low. More demanding games like Risen 2 are not much fun even at the lowest settings. The Elder Scrolls V: Skyrim manages to run without major lag. Using the native resolution of 1280 x 800 pixels and high details proves too much for pretty much all current games. Under Mac OS X, we played or Diablo III benchmark sequence. After game start, we teleport the character to the market square of New Tristram. From there on, we let him run along the street towards the upper right, have him turn around at the bushes, and run back the same way. At the lowest settings, anti-aliasing off, and resolution set to 1024 x 768 pixels, we were able to play the game without an significant lag, which means that even the harder levels that follow should be enjoyable. Medium details and a resolution of 1280 x 800 pixels still worked OK for New Tristram, but we expect the game to stutter at the higher levels. To find out which games work well with a particular graphics card, please check here. Since Apple does not offer a dedicated graphics card for the smallest MacBook Pro, the notebook is not particularly well-suited to play games. The Intel HD Graphics 4000 can handle older games, but newer ones are not a lot of fun. During every-day use, the Apple MacBook Pro 13 Mid 2012 remains pretty inaudible most of the time. This is true for Windows as well as Mac OS. During idle, the fan spins at a constant 2000 RPM. 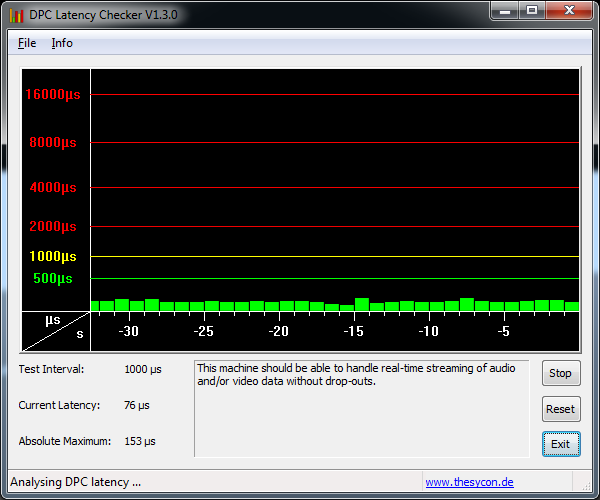 We measured the noise level at 30 to 32 dB; the latter number is caused by the DVD optical drive. The hard drive, although very quiet, emits a constant (but not annoying) whirring sound. Under load, the fans spins up quickly - more so under Mac OS X than under Windows 7. While the maximum noise level of 44 dB is identical for both platforms, we noticed that the fan spins higher under Mac OS X at medium load levels. The result: 40.1 dB compared to 33.1 dB - a significant difference. The benchmark results are based on Mac OS X, simply because this is what the manufacturer expects to be used. In this case, the native OS was not really at an advantage. The smallest MacBook Pro under maximum load: a CPU core temperature of over 100 degrees leads to throttling. 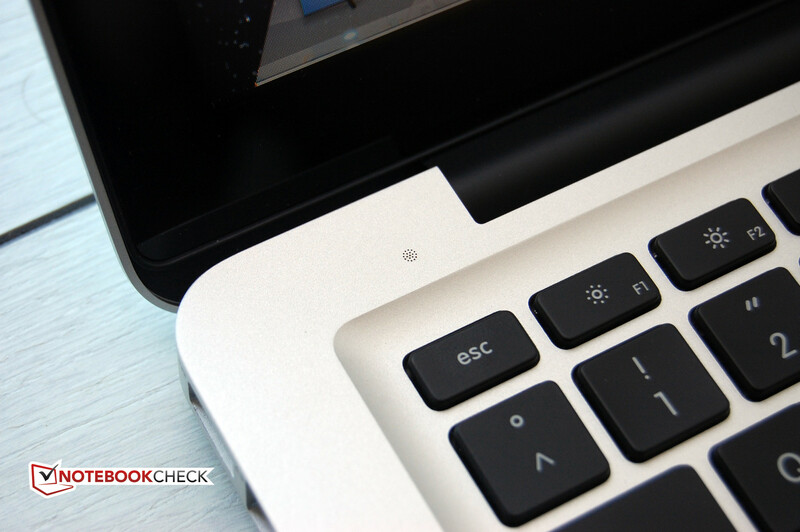 The Apple MacBook Pro 13 Mid 2012 stays cool even during the summer and periods of increased temperatures. During idle, the aluminum unibody chassis stays cool to the touch. We didn't measure above 30 degrees Celsius (86 degrees Fahrenheit) in most spots. Only the underside in the left upper corner got a bit warmer at 32 degrees Celsius (89.6 degrees Fahrenheit). To use the notebook on the lap is possible for hours on end without any ill effects (even on bare skin, as it might happen during the summer season). There is no significant difference in this regard between Mac OS and Windows, even though that is not true for the noise level. Under maximum load during our stress test - which is not a scenario normally encountered - the notebook heats up as expected. Since the temperatures remain under 50 degrees Celsius (122 degrees Fahrenheit) at all times, we have no reason to complain here. The power adapter also stays cool with a maximum of 40 degrees Celsius (104 degrees Fahrenheit) under load. To check if the CPU throttles (runs at a frequency lower than the nominal frequency) when subjected to continuous load, we ran Furmark and Prime95 for several hours. 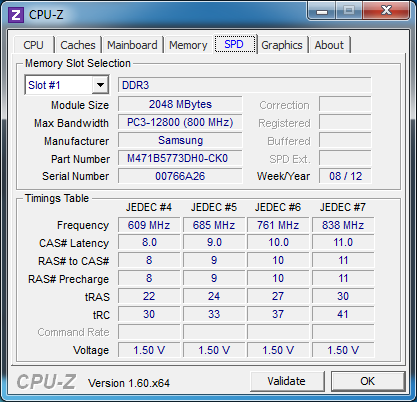 After a few minutes, the CPU briefly lowered the clock speed down to a low of 1.2 GHz. The reason for this behavior is the high CPU core temperature of 104 degrees Celsius (219.2 degrees Fahrenheit). As soon as the CPU cools off, the frequency increases again - up to the Turbo Boost maximum of 2.9 GHz. When we ran a 3DMark06 directly after the stress test, the results (compared to when the notebook was still cool) were no different. The intermittent throttling therefore has no real impact on CPU performance itself. This is also true for Mac OS X. When we ran the Cinebench R11.5 Multi-CPU test in an endless loop (using a script), we ended up with the same exact results, even two hours later. 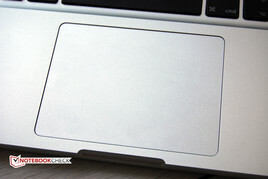 (+) The palmrests and touchpad are reaching skin temperature as a maximum (34.8 °C / 94.6 F) and are therefore not hot. (-) The average temperature of the palmrest area of similar devices was 28.6 °C / 83.5 F (-6.2 °C / -11.1 F). Another area where we have nothing new to report. The MacBook Pro 13-inch has stereo speakers which sit above the keyboard and emit their sound towards the display. The speakers are not visible, but sound quality is very decent. The maximum volume level is surprisingly high, although the mids are slightly over-emphasized. The result is that both bass and treble are lacking. Overall, the speakers are usable for playing games and watching movies. Those looking for higher quality might want to use headphones instead, since the quality of the output is quite good. Once Apple decides on a certain technology or design, they usually stick with it for quite some time. Case in point is the lithium polymer battery used in the smallest MacBook Pro - the capacity of which has been 63.5 Wh for quite a few years now. Unfortunately, the battery is still not user-replaceable. Compared to current Ultrabooks, like the Sony Vaio SVT1311M1ES, the capacity is actually quite large. Apple states that the battery should last at least 1000 recharge cycles. 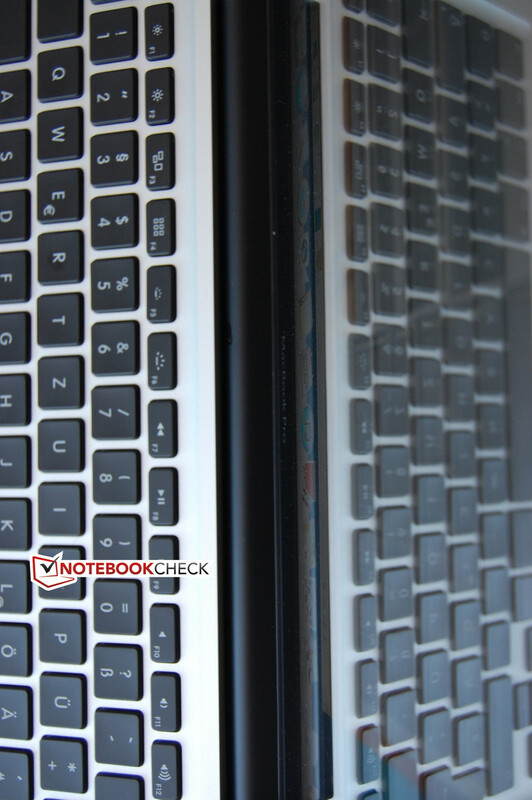 We measured the power consumption for the notebook under both operating systems. Under Windows and during idle, the notebook consumed between 10 - 16 watts, under Mac OS between 7.2 - 10.7 watts. This is a pretty significant difference and favors the Mac OS. The picture doesn't change much under load: at around 50 % load, the MacBook Pro consumes about 45.3 watts under Windows, while the consumption under Mac OS levels out at 37.4 watts. Under maximum load, there is no significant difference between Windows and Mac OS. The consumption during standby and off-mode are also identical and very low. All things considered, the MacBook Pro is pretty energy efficient. The Mac OS leaves a much better impression here. Since we determine battery life using the tool Battery Eater Pro, we conducted all tests under Windows. To determine if Apple's OS X has the better energy management, we ran our WLAN test (which simulates a real-life scenario) on both platforms. To find out the maximum battery life, we deactivate wireless, turn the display to its lowest brightness, and use the "Power saver" profile. 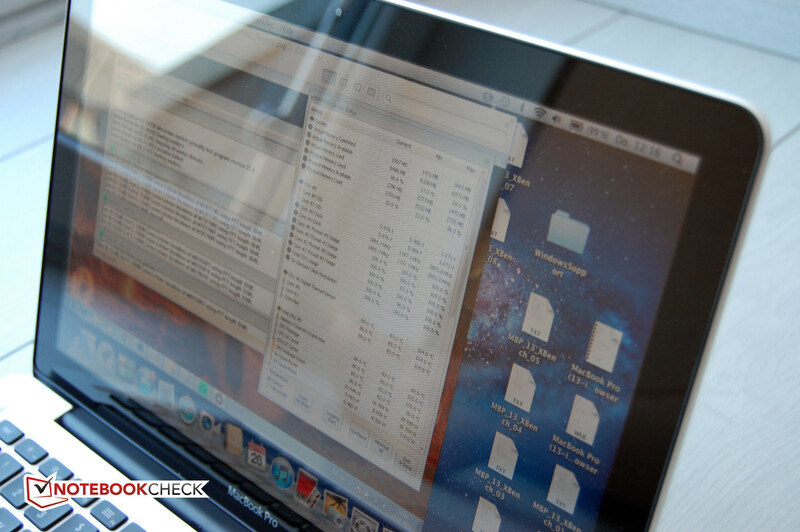 The Apple MacBook Pro 13 Mid 2012 ran almost for eleven hours. For the other extreme, the Battery Eater Classis test, we use maximum display brightness, enable WLAN and Bluetooth, and subject the notebook to a very heavy load. The MacBook shut down after 99 minutes, which is still a very good result. The WLAN-Surftest uses a display brightness of 150 cd/m2 and the Power saver profile. Webpages containing text and multimedia content (to accurately reflect a frequent use-scenario) are visited automatically. Running under Windows, the MacBook lasted for more than six hours, a respectable result. Under Mac OS, however, the notebook lasted an outstanding (almost) eight hours. Equally impressive is the DVD run time of 4:14 hours. This should be sufficient for even the longest movies. The Apple MacBook Pro 13 Mid 2012: very good overall, but the notebook tries to compete with Ultrabooks as well as performance machines. The Apple MacBook Pro 13 Mid 2012 is, just like its predecessor, a powerful notebook with great battery life and outstanding build quality. 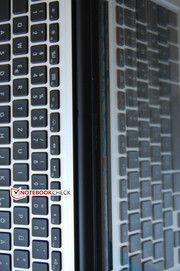 But is has competition from two sides: the modern Ultrabooks on one, and Apple's own MacBook Air 13 Mid 2012 on the other. As the smallest member of the Pro-series, this notebook is supposed to deliver the correct balance between performance, mobility, and last but not least, price. We think that Apple doesn't quite hit the mark here. 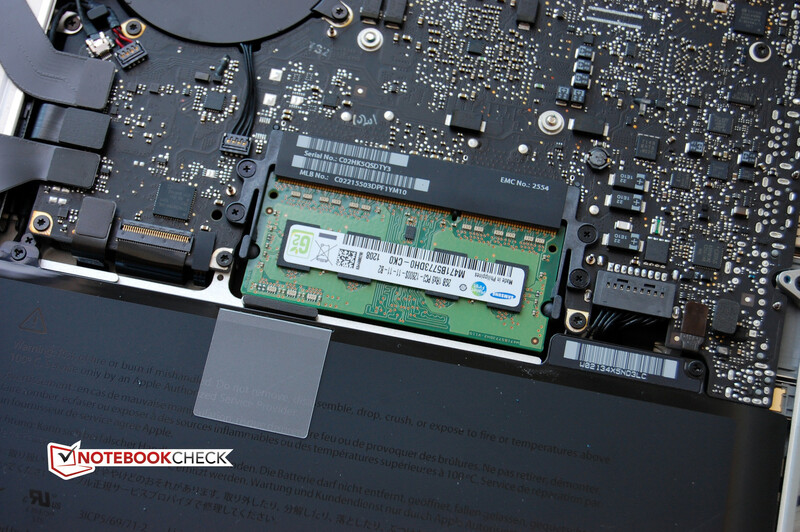 The MacBook Pro does feature a pretty powerful processor and can back up its performance claims with benchmark results. On the other hand, the included RAM is not really sufficient, considering this is a Pro model. At least for Mac OS, an increase in RAM should be considered. The same is true for the (fairly sedate) hard drive that Apple uses. A SSD would be a much better fit here and increase overall performance significantly. We find absolutely no issues with the workmanship. The build quality is just superb and very few competitors have notebooks that come close in that regard (and none have surpassed the MacBooks as far as build quality is concerned - at least not in our book). The keyboard is well suited for fast typing, even in the dark, since it features a backlight. The touchpad simply has no equal. The display is also hit and miss. The TN panel is very bright, has a low black point, offers great contrast, and adequate viewing angles. But unfortunately, the resolution of 1280 x 800 is a downright antiquated. We would like to see a higher resolution here. In addition, the panel does suffer from reflections (since it's a glare-type). There are rumors talking about a 13-inch Retina model, however. As far as mobility is concerned, the MacBook Pro 13 Mid 2012 is top-notch. The weight of two kilogram (4.4 pounds) is OK, considering the rather compact dimensions and the fact that an optical drive is included. The outstanding battery life allows the user to venture far away from any outlets. Those wanting to play games should not mistake the meaning of the word "Pro" in the name. Due to the integrated (processor) graphics, the notebook is not really well-suited for newer games. A dedicated graphics card is not an option, even for a surcharge. Speaking of surcharge - RAM and SSD options seem way overpriced. At least both components are upgradable by the user. So what is the final verdict? 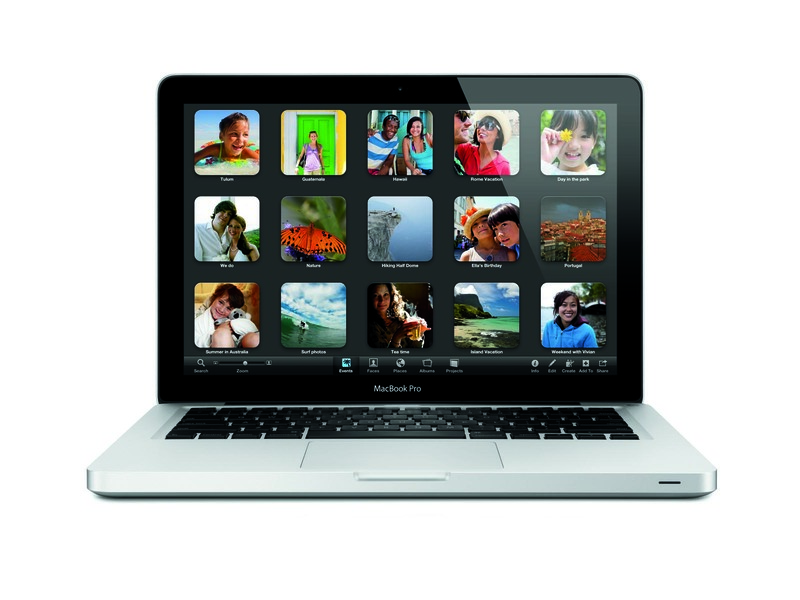 The MacBook Pro 13 Mid 2012 is a solid and compact workhorse, featuring impeccable build quality and great battery life. But due to the missing dedicated graphics card and the comparatively low display resolution, it's not quite up to par any longer. The base price of 1249 Euro seems a bit high. We can only recommend it to users who need a small notebook with an integrated optical drive and good performance. In a use-case like that, the notebook offers a very good compromise. Back to the question we asked in the beginning: stepchild yes, unloved, no. No Apple without the Apple. and the fan from the inside – very easy to clean. Access to the internal components is easy. ... without the bottom cover. The white LED provides information about the system status. Blinking indicates "standby". And this is where you turn it on. 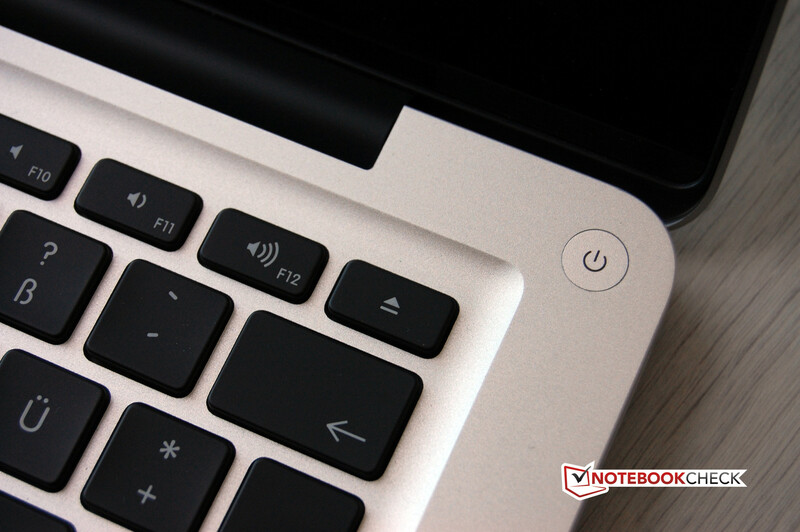 The MacBook Pros series still feature a "real" power button. This is where the notebook opens up. The display lid is very rigid, but very thin. The construction is exemplary. The notebook is sturdy yet compact. Even though the display lid is very thin, it's torsionally rigid. Keyboard and touchpad are top-notch. A display with a higher resolution, non-glare preferred. Overall the display is good, but the resolution is just not adequate. And the glass layer on top makes outdoor use in direct sunlight next to impossible.